With sumo dominated by Mongolians and Sony already fielding a foreigner in the fold, the giant of all Japanese giants, Godzilla, also seems to have finally succumb to the force of foreign infiltration. 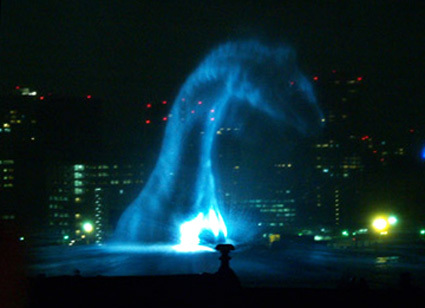 His current disinclination to destroy Tokyo may well have something to do with it, but either way, the monster has at least temporarily been muscled out by that legendary loner the Loch Ness Monster — the secretive Scot currently making uncharacteristically bold appearances in Tokyo Bay. Albeit due to the success of a sizeable water screen. And, perhaps predictably, in the pursuit of promotional purposes. Impressive. Pity things in Adelaide aren’t equally as impressive. Very well done – was it a hologram type technology, was it an image projected onto water vapor… or was it just computer effects done in a studio? Well, whatever the case, it looks very well done. Its just a normal projector and a water screen. they have been doing that in Disneyland and Disney World for Fantasmic! since 1992.